All of it looks good, but noteworthy is Poulter's article "The Transition to Late Antiquity", Peter Heather's "Goths in the Roman Balkans c.350–50"; Peter Guest's "Coin Circulation in the Balkans in Late Antiquity" and Neil Christie's "From the Danube to the Po: the Defence of Pannonia and Italy in the Fourth and Fifth Centuries AD". A lecture series available as free PDF files. late antiquity, spätantike: when did it happen? Gibbon's main source in Chapter XXXVIII is Gregory of Tours (c. 538 - 594). He was the son of a senator from Clermont (Sidonius Apollinaris' see) who seems to have died while Gregory was still quite young. Gregory was educated by his uncle Avitus, the bishop of Clermont. 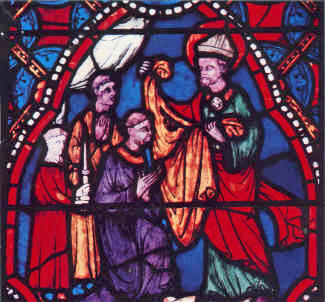 In 573 Gregory became bishop of Tours. Many of his predecessors were his relatives. He is best known for his "Ten Books of Histories" or as it is more commonly known these days "The History of the Franks." Some pictures of artefacts from Gregory's time. The figures Gibbon particularly draws our attention to in the early history of monasticism are St. Anthony in Egypt and St. Martin in Gaul. Monasticism seems to have started in Egypt, and we have accounts of some of the monks by Rufinus and Palladius. Perhaps the most famous of the monks was St. Anthony, a life of whom was written by his contemporary admirer, Athanasius. The Catholic Encylopaedia has a more modern account. Anthony has been a popular subject for painters: Hieronymus Bosch painted a lurid picture of Anthony's temptation by demons. Another picture on the same subject was painted by Matthias Grünewald as part of the Isenheim Altarpiece, which also contains a more restful picture of Anthony's visit to St. Paul the Hermit. … And it is the moment, with the emperor at the absolute zenith of his achievement, that the world encountered the first pandemic in history. 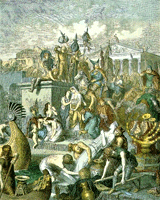 The coincidence of timing does not, of course, prove that the pandemic caused Rome to fall, or Europe to be born; as above, the uncertainties of the three thousand-body problem makes such a claim fundamentally uncertain. So writes William Rosen in his Justinian’s Flea: Plague, Empire, and the Birth of Europe (Viking Adult 2007, 384 pages). Nonetheless, the tenor of this wide-ranging book is that the plague was the instrument that caused a change in history and Rome to fall, as outlined in the Introduction and Prologue. The reasoning for this particular version of the fall of Rome and the "birth of Europe" is rather attractive but not wholly convincing. Despite the enormous loss of life, the eastern empire still went on, even expanded for a while with Belisarius' victories on the west. As a member of the "educated public" (see below), I have been struggling lately with this question: What is Late Antiquity/Spätantike, and how is it framed? There are so many different views out there. Jill Harries, the author of the Sidonius book mentioned below, has also written Law and Empire in Late Antiquity. Here is a Bryn Mawr Classical Review. A brand new book on Roman legal history of hers is Cicero And the Jurists – Bryn Mawr Classical Review. The Fall of the Roman Empire Revisited: Sidonius Apollinaris and His Crisis of Identity Eric J. Goldberg. (Essays in History, The Corcoran Department of History at the University of Virginia).